LAPWAI, Idaho -- In this remote corner of the Northwest, most people think of gas as something coming from a pump, not a well. But when it comes to energy, remote isn't what it used to be. When the hauler's giant load arrived one night in early August, more than 200 feet long and escorted by the police under glaring lights, the tribe tried to halt the vehicle, with leaders and tribe members barricading the road, willingly facing arrest. Tribal lawyers argued that the river corridor, much of it beyond the reservation, was protected by federal law, and by old, rarely tested treaty rights. And so the Nez Perce, who famously befriended Lewis and Clark in 1805, and were later chased across the West by the Army ("I will fight no more forever," Chief Joseph said in surrender, in 1877), were once again drawn into questions with no neat answers: Where will energy come from, and who will be harmed or helped by the industry that supplies it? Tribal leaders, in defending their actions, linked their protest of the shipments, known as megaload transports, to the fate of indigenous people everywhere, to climate change and -- in terms that echo an Occupy Wall Street manifesto -- to questions of economic power and powerlessness. "The development of American corporate society has always been -- and it's true throughout the world -- on the backs of those who are oppressed, repressed or depressed," said Silas Whitman, the chairman of the tribal executive committee, in an interview. "We couldn't turn the cheek anymore," said Mr. Whitman, 72. The dispute spilled into Federal District Court in Boise, where the Nez Perce, working alongside an environmental group, Idaho Rivers United, carried the day. Chief Judge B. Lynn Winmill, in a decision this month, halted further transports until the tribe, working in consultation with the United States Forest Service, could study their potential effect on the environment and the tribe's culture. "For the longest time in North America, you had very defined, specific areas where you had oil and gas production," said Bobby McEnaney, a senior lands analyst at the Natural Resources Defense Council. A band stretching up from the Gulf of Mexico into the Rocky Mountains was about all there was. The Nez Perce's stand, in a way, makes Mr. McEnaney's point. The tribe's fight, and the galvanizing decision by its leaders to step in front of the transport, drew in people who had not been involved before. "Our history is conservative. You don't go to court, you don't fight," said Julian Matthews, another tribe member. The fighting stance by tribal leadership, he said, was partly driven by pressure from members like him, already pledged to opposition. Others described the board's decision as a thunderbolt. After the special meeting where leaders agreed they would face arrest together, the news blazed through social media on and off the reservation. "Everybody knew it in an hour," said Angela Picard, who came during the four nights of protest when the load was still on tribal lands, and was one of 28 tribe members arrested. "The least I could do was drive 30 miles to stand at their side," said Ms. Rathmann, whose church has declared climate change to be a moral issue, and recently sponsored a benefit concert in Moscow to raise money for the tribal defense fund. The equipment manufacturer, a unit of General Electric, asked the judge last week to reconsider his injunction, partly because of environmental impacts of not delivering the loads. Millions of gallons of fresh water risk being wasted if the large cargo -- water purification equipment that is used in oil processing -- cannot be installed before winter, the company said. "Although this case involves business interests, underlying this litigation are also public interests surrounding the transportation of equipment produced in the U.S. for utilization in wastewater recycling that benefits the environment," the company said. 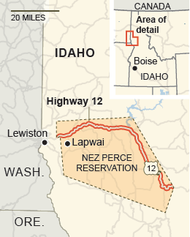 The risks to the Nez Perce are also significant in the months ahead. Staking a legal case on treaty rights, though victorious so far in Judge Winmill's court, means taking the chance, tribal leaders said, that a higher court, perhaps in appeal of the judge's decision, will find those rights even more limited than before. "It was magic," said Ms. Smith, 44, who was among those arrested. Her 3-year-old grandson was there with her -- too young to remember, she said, but the many videos made that night to document the event will one day help him understand.